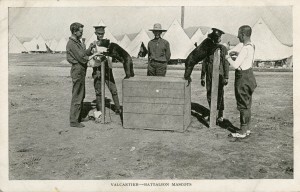 Military units identified themselves with adopted animal mascots, including goats, dogs, and birds. 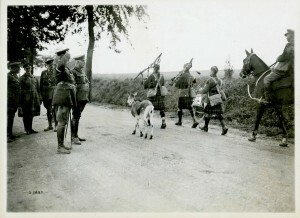 The animals lived in the field alongside the soldiers. 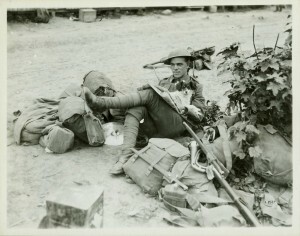 Many soldiers had pets in and near the front line trenches. Small dogs and cats were most common, and they helped soldiers normalize the harsh world of combat. Enemy pets were sometimes adopted after a battle, renamed, and became part of the soldiers’ community. The most famous Canadian mascot was a black bear cub named Winnipeg which traveled overseas from Canada. The unit decided to place Winnie in the London Zoo, rather than subject her to the rigours of the front. She delighted thousands of visitors and later became the inspiration for A.A. Milne’s Winnie-the-Pooh. 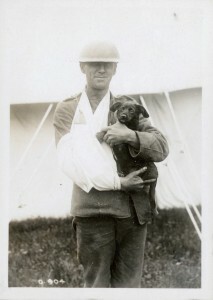 A wounded Canadian soldier holds his puppy. Animals of all kinds lived in the trenches alongside soldiers.